On the 10th of January this year, I woke up to go to college just like every other day- blurry eyed and fumbling for my phone to snooze the alarm for another precious ten minutes. However my anticipated ten minutes of bliss was cut short by the BBC notification, stating that music legend, David Bowie, had died. Now don’t get me wrong, I'm not a die-hard Bowie fan. I don’t own any of his vinyl or have his face plastered around my room . The way I discovered Bowie was due to my Dad about a decade ago, on a Friday night with a bowl of chocolate buttons and the film Labrynth, a film I watched repeatedly throughout my childhood, over and over again, so much so I can still quote it today. Since then, I have listened to the many favourites from David Bowie, collected a few CDs and loved every one of them. I was musically awakened at Beck’s re-imagination of Sound and Vision and it spurred me on to love Bowie further. After the united sadness of his death struck the world’s hearts in a way we never thought it could, I listened to Bowie’s critically acclaimed and superbly orchestrated Blackstar, and found it was full of virtuosic segments, entwined with Bowie’s breathy and ghostly voice and bouts of his seventies and eighties origin. The first track Blackstar begins with a minor flute entry which sets up the idea that this song is going to be slightly spiritual or wraith-like, becoming more dramatic as bars of orchestrational tutti fade in and out. The dissonant choir gives this effect more power, and I loved this as it created something a little odd, not musically beautiful or romanticised, but something of skill and intelligence. The song moves away from something so atonal into something more heavenly or bluesy, which I also enjoyed. The meaning behind the repeated phrase “I’m a Blackstar” has been summarised by critics to symbolise the occult which I can picture Bowie writing due to his fondness of oddity and innovation. The song finishes briefly, which could perhaps symbolise the brief finale of Bowie’s life, or indeed be because iTunes would not publish a song more than ten minutes long as a single. Whichever the reasoning may be, it is clear that Blackstar is an iconic piece that will, like all Bowie’s other hits, influence for generations to come. I Can’t Give Everything Away was song I immediately liked due to its blissful harmonies between strings and harmonica, and presentation of David’s voice in a way that could be described as it’s finest- polished and soaring. The beat and rhythm inspires foot tapping and head nodding, and no piece of Bowie’s Blackstar would be complete without a skilled and gifted saxophonist improvising to create an ecstatic song. The addition of guitar half way through adds to overall happy tone of the piece, however the lyrics may be presented in this positive way, but do indeed hold some less dynamic encrypted messages. Overall, I Can’t Give Everything Away was my favourite from Blackstar, I couldn't fault it. In contrast, I didn't particularly like Girl Loves Me, but as a musician I can obviously appreciate the skill and quite frankly work of genius that it may be. The mixture of hollow voices and again impeccable orchestration gives this song a more edgy feel over the rest and this worked very well, especially with the addition of the synth around two thirds of the way through which is a remnant of Bowie’s roots of an icon of many decades. Furthermore, the syncopated rhythms add to the overall weirdness of the song which creates an atmosphere to me of hypnotic and trance-like sensation; as much as Girl Loves Me didn't please my taste, you can’t deny that it was written in a way that inspires ideas of professionalism. The entry of Tis a Pity She Was a Whore gave me Goosebumps and flooded me with emotion as the slow sighs of Bowie himself filled my ears. The song then progresses into some kind of fast bluesy or jazzy track filled with musicians at their best. The long instrumentals provide the feeling of wanting to dance or shake your head in time to the ascending scales of the saxophones, reaching the top of their pitch in grand splendour. Again, I automatically loved this piece ,despite the overtly slightly sexist lyrics and repetitiveness, because of the way Bowie sings (influential, and indeed, just like the old days) and the maestros he has to back him. 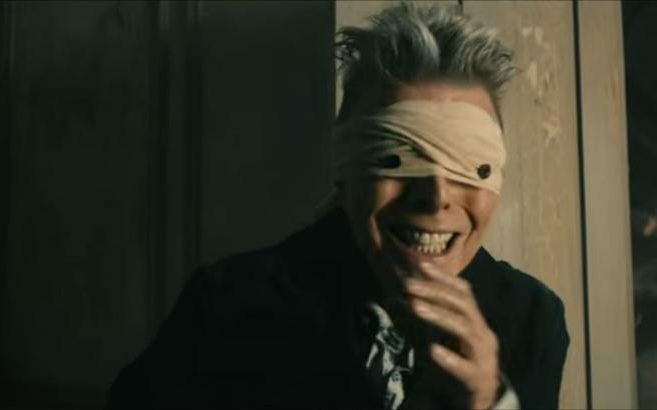 Lazarus, everyone has stated how this was a pre-emptive message of Bowie’s death, with it’s lyrics such as “Look at me I’m in heaven/ I’ve got scars that can’t be seen” and “Everybody knows me now” which may be suggested as I slight dig at the fickle minority who claim to love legends once they have died. The video, which lacks Bowie’s usual love for colour and splendour and culture, highlights this message in a way that moved me tears when I watched it. Musically, the piece relaxed me though, which could suggest perhaps Bowie’s embrace of death- o put it bluntly, I liked Lazarus, a lot, as it made me feel emotions inside I can’t quite put my finger on, but may be described as mourning yet comfort, as well as musical satisfaction. The album for me personally changed the way I viewed Bowie; to my idea of the influential figure of music. In my opinion, Blackstar was indeed the way for his incredible and long career to end, with not so much of a bang but more a dignified yet authoritative and powerful full stop;.I hope to see generations of young and old enjoy Blackstar for the talent, and see it not only as beautiful or just as music, but see it as art.